Since the blackeye peas featured heavily in my last post, I thought perhaps I should post the ‘recipe’ for this simple and popular Ramadan dish (well, popular in Trinidad, would love to hear if others know about it). When I called it googni on Facebook last week, I got a couple queries about the name, but people know what the dish is even if the names are different. Boil and fry channa is a ubiquitous snack sold in various Guyanese establishments, often sold in little disposable cups. Googni is a term I grew up using for all types of boil and fry peas and beans – so during Ramadan people would make blackeye peas googni or channa googni. Actually those are the only 2 types I can think of in Trinidad, but there may be others I do recall that as a child, when I saw boil and fry channa on the Iftar dish, I was never impressed. I didn’t understand why people just didn’t curry the channa! It went so much better with the fried kachourie or saheena, plus it was half of being a doubles!!. And not everyone can do a good boil and fry…for years I swore that boil and fry meant “hard and dry”. But it doesn’t have to be like that. Really! I made almost a pound of blackeye peas. * Sister-the-elder was a bit surprised, but 1. I wanted to have enough for days so I could be sure to replicate some small part of my childhood Iftars and 2. I forgot how much the peas swell when cooked. But back to reason number 1! Typical things people would bring to the masjid for communal iftar – dates of course; fried stuff like pholouri, kachourie, goolgulah or saheena; fruit like watermelon, bananas, pineapple, apples, grapes; sweet stuff like cake, sweetbread or packaged biscuits; and channa, either curried or boil and fry (googni) or blackeye googni. Chutneys to go along with fried stuff, which also tastes pretty good with channa and blackeye! And maybe some ginger, which is used to help with “gas” after a day of fasting. I cannot replicate all of that at home just for me, or even for me and the sister, but having googni around is part of that traditional meal. So I have been breaking fast with it every day since I made it, taking a little container of it with me when I go to sister-the-elder’s. When I had first made it, she wasn’t sure about it because I had omitted pepper, which she considers essential to the dish. However, come her first day of fasting, possibly feeling those reminiscing urges as well, she asked me to bring along enough for her in my container and we had it with some tamarind chutney along with our dates and cake. I’ve spelt it “googni” but if you do a search for “ghugni” or “ghoogni” you might encounter the root of the term and how it is used in the Eastern part of India (Oriya cuisine) or in Bihari cuisine. While some versions may use different types of peas, or add potatoes, it seems common that googni consists of some kind of peas sautéed with spices and aromatics. My aunt suggested the addition of saltfish, which would seem very West Indian The combination of spices and herbs can be infinitely varied to suit your taste, compliment your peas or the accompaniments. Just make sure you cook the peas enough! 1. Boil blackeye peas in water, with smashed garlic and salt to taste until cooked. (I cooked them in a pressure cooker and they were done in 15-20 minutes). Drain the peas. 2. Use a wide, deep pan (I used a wok). Heat oil on medium-low heat. Add onions and peppers and sauté until the onions are translucent (I like my onions WELL cooked). 3. Add minced garlic and chives, stir for about 20-30 seconds. 4. Add peas, with the bandhania, geera, coriander and black pepper to taste. Stir constantly to mix thoroughly and check for salt. It’s ok if the peas get a little mashed in the process. The flavours will get to the core of the bean! Enjoy as is, or with some chutney! * peas and such are sold by the “pint” in Guyana, which is somewhat less than a pound. 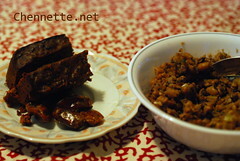 This entry was written by Chennette and posted on August 19, 2010 at 9:00 am and filed under Eid ul Fitr, Ramadan, recipes. Bookmark the permalink. Follow any comments here with the RSS feed for this post. Post a comment or leave a trackback: Trackback URL. Nice post…googni is also made using fresh or dried pigeon peas….. I remembered pigeon peas this morning, but can’t remember ever having that as googni though. Never heard of the name before but I’ve had boil and fry black eye before. As you have stated, boil and fry channa is all over Guyana and it was one of my favourite things to buy from the snack lady while at school. She’d sell it with generous lashings of sour that would soak through the paper it was wrapped in and the paper bag! At one time, I think channa was scarce and so she made the boil and fry with black eye peas instead, that was a revelation and we all loved it just as much as the channa. Aka..are you from central trinidad as my in-laws called if googani and some here in central still do, but up north it was goognie ….and yes pigeon peas was a favourite for goognie once the season started as well as pigeon peas puri. trinimom, I lived all my life in the East but my grandparents on my father’s side came from Central. It was from my grandmother, I think, I heard the name googani from. My mother makes a pigeon peas puri from time to time but fresh peas googani is still my favorite.